My romance gal pals run on coffee & laughter. It’s 5:30 in the morning. 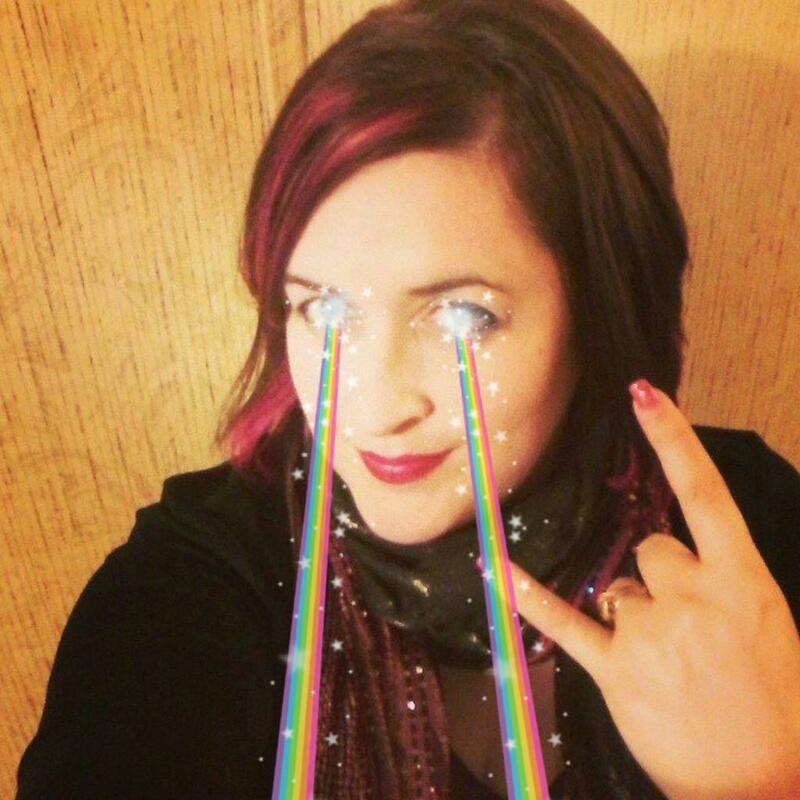 I had too much sugar and excitement so I’m hyper like a seven year old and sitting around trying to decide what was the most fun about the Washington Romance Writers Readers & Bloggers luncheon yesterday. ROAD TRIP! I traveled up to the luncheon in Bethesda, MD with Joanna Bourne, Sue London, and Adriana Anders. This week I’ve been writing furiously writing on my WIP, we had out of town guests–which if you’re like me requires some pretty intensive house cleaning, not to mention yard work, and several other things were going on as well. 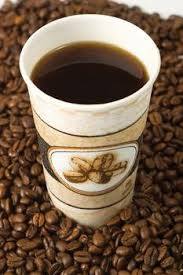 By the time I picked up Adriana to head to our rendezvous point I was so deep in absent-minded writer head I could barely figure out the gas pump at the station, requiring not only Adriana’s helpful pointers but some random man’s input as well. Made it to rendezvous point late and scrambled into Sue London’s car. Along the way we sang 80’s songs while I simultaneously tried to put on make-up, and tie together chocolate truffles and bookmarks with ribbons. Which is how I left a big gash of mascara on Sue’s immaculate car ceiling. Sue was incredibly calm and gracious about the whole thing, even after I followed this up by spilling hot tea all over her car/my crotch. Doh. WE’RE ALL CHARACTERS FROM A ROMANCE NOVEL: At this point Adriana Anders, who was keeping up a funny running commentary the whole way, offered to help me out with the bookmarks and chocolate. She and Jo Bourne were in the backseat trying to get ribbons through tiny holes in the bookmarks and getting carsick in the process. Sue pointed out that we were behaving like characters out of a romance novel. So true—with me as a hapless, high-energy friend that everyone had to help out of a jam. Adriana said she didn’t mind being the side-kick as long as she got to have a potty mouth and be the slutty one (!) 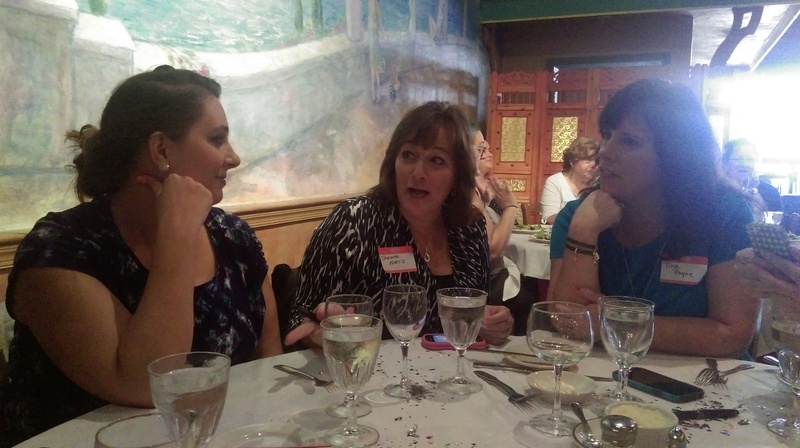 Eventually the bookmarks were all prepared, I stopped defacing Sue’s car, and we all arrived at the Italian restaurant just as Kimberly Kincaid, romance author & event organizer, arrived with her posse, including her partner in romance crime, Avery Flynn. Romance authors or super heroes? You decide! 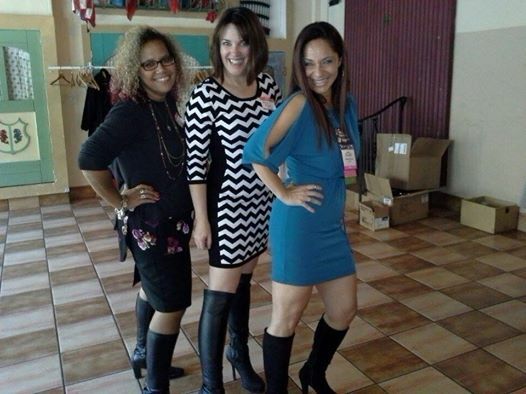 Robin Covington, Avery Flynn, and Kimberly Kincaid. BINGO! When readers arrived, we played a bingo game – where readers matched up authors with clues about the author or her books. The clue for me was “writes about Sexsomnia”. 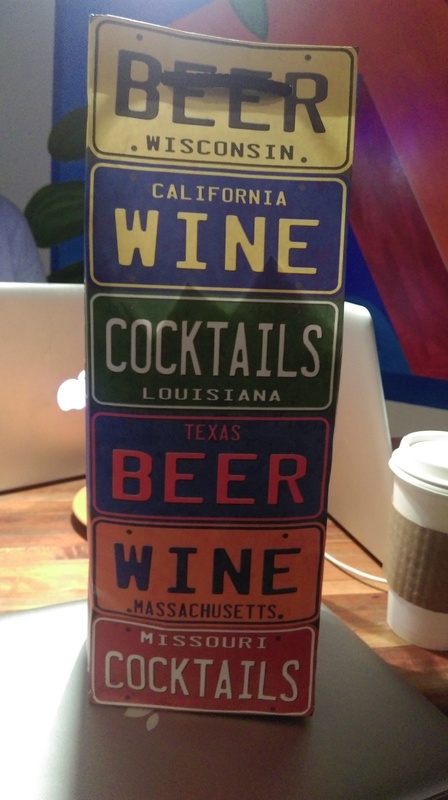 Okay – whoever thought of this (I’m looking at you Kimberly Kincaid) it was crazy brilliant. Soon we were all chatting with readers about our books, and some were even sharing smutty #fridaymanwars photos on their phones. I met Nerd Girl from NerdGirlOfficial who seemed very cool and very interested in my book. Yaaaaaaaaay! 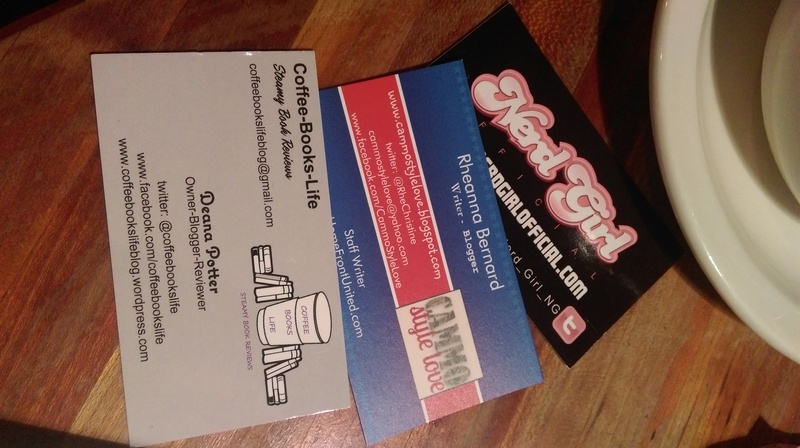 Gettin’ cards from awesome romance bloggers. LUNCHA-MUNCHA Then we all sat down to eat. I was at Avery Flynn’s table where I met three of her super-fans: Rheanna, Shawna, and Tina. The gals discuss their fav romance book recommendations. I got great romance recommendations from the gals and Shauwna was so excited to read the anthology. I also met Valerie Halfin who has a very funny sense of humor. 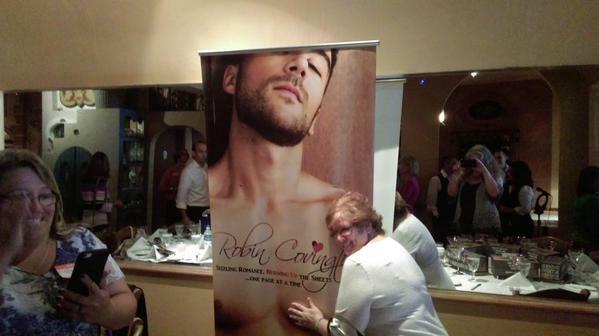 She’s pictured here with her new boyfriend, aka Robin Covington’s book cover. Valerie canoodles with her new book boyfriend. 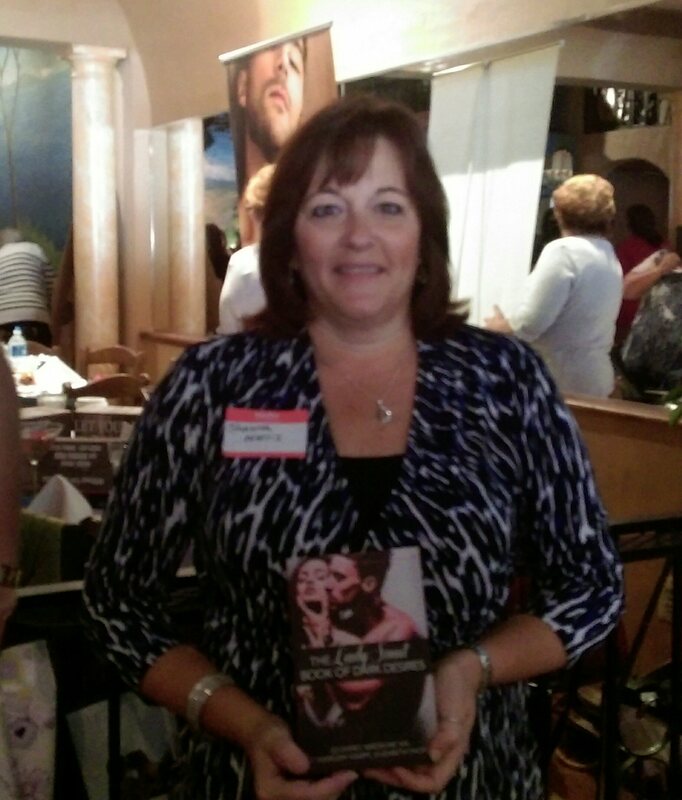 TABLE GIFT BAGS: Geri Kertow was also at our table and told readers heartfelt stories about her military husband. She brought our readers these huge mega-cute Halloween-y baskets full of chocolate, cozy socks and some of her Harlequin romantic suspense books, along with other fun stuff. Avery Flynn’s bags had champagne and lavender aromatherapy masks, along with books and chocolate. 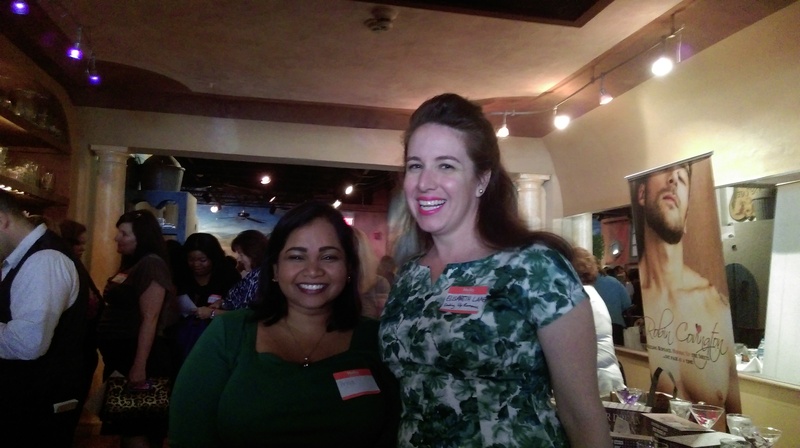 Blogger Elisabeth Lane and reader. That’s what it’s all about. GIFT BASKET GIVEAWAY: Dessert came with a gift basket give away – and I must say the twenty or so baskets looked a-mazing. Elizabeth Lane won a basket from Hope Ramsay, queen of crafty. This year she made a Christmas themed basket, that included a felt star shaped ornament decorated with beads and stitching–and Hope actually made it herself! (Why does no one take pictures of these things????) I bow down before her tasteful way of putting out thoughtful goodness to readers. Whatever she does it always has the same kind of simplicity and sterling character of her small town books. 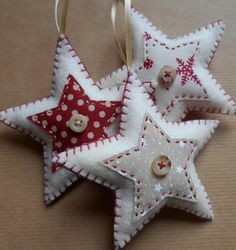 I mean, who wouldn’t want a homemade felt star for their Xmas tree? MINGLE-SCHMINGLE Then after dessert we were done—but tell that to a bunch of women having a great time. Of course we stayed and mingled some more. I got to see one of my bestest romance buddies ever: Wendy La Capra! She was canoodling with some of her major fans ladies from the SOSAloha blog and a few other ladies who came down from New York and New Jersey just for the luncheon. Lurv you Wendy! I also got to hang with Shari Slade who was wearing an adorable black dress with a tiny white heart print and shoulder cut outs. Shari is who you would have wanted as your cool older sister when you were in high school. She is wise to the ways of pink hair dye and always brings just the right sort of hip fun into my romance world. I just love her books too. I mean, Shari Slade is the coolest ever. I got to say ‘hi’ to a reader that I met last year named Donna who was there again. Oh, and the Reading in Pajamas blogger Donna (a different Donna) was there as well, and she was just the sweetest woman.